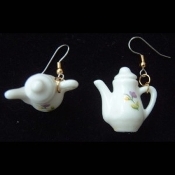 Huge Funky TEA POT EARRINGS - Ceramic China Miniature Doll Toy Novelty Costume Jewelry - Mini Real China-look Tea Pot. CERAMIC dimensional miniature doll size COFFEE TEA POTS food theme charm. Approx. 1.25-inch (3.13cm) tall. Tea for Two?? ?